The Trachea or windpipe is a membranous tube about 12cm long attached to the larynx and lying anterior to the oesophagus. It is supported by 12 to 20 C-shaped rings of hyaline cartilage. The cartilage rings reinforce the trachea and prevent it from collapsing during inhalation. The posterior wall of the trachea has no cartilage and contains an elastic ligamentous membrane with bundles of smooth muscles called the trachealis muscle. Contraction of the smooth muscle can narrow the diameter of the trachea. During coughing, this action causes air to move more rapidly through the trachea which helps to expel mucus and foreign objects. 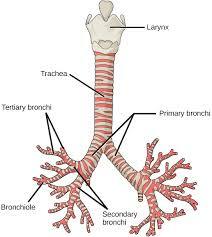 The trachea divides into the right and left primary bronchi at the inferior end, each of which extends to a lung. The inferior tracheal cartilage forms a ridge called the carina. The carina is an important radiological landmark and it is very sensitive to mechanical stimulation. Materials reaching the carina stimulates a powerful a powerful cough reflex. The mucous membrane lining the trachea consists of pseudostratified ciliated columnar epithelium with numerous goblet cells. The mucous produced by the goblet cells traps inhaled particles and the cilia move the mucous and particle to the larynx, from which they enter the pharynx and are swallowed or spit out. Constant long-term irritation to the trachea can cause the trachea epithelium to become moist stratified squamous epithelium that lacks cilia and goblet cells as is the case with smokers. In emergency cases where the upper airway is blocked by foreign objects that affects breathing, the Heimlich manoeuvre can force such objects out of the passageway by the sudden application of pressure to the abdomen, forcing air up the trachea to dislodge the obstruction. In some conditions, where the trachea is injured, the mucous membrane may become inflamed and obstruct the passageway; the inflamed membrane secretes excess mucus that may clog the lower respiratory passageway. Also, aspiration of objects can cause obstruction of the passageway. If the obstruction is above the level of the larynx, a tracheostomy (an opening is made into the trachea) or a minitracheostomy may be performed. Suctioning of excess mucus can be done through the tracheostomy tube. A patient can also be intubated (insertion of a tube through the mouth or nose into the pharynx) through the mouth or nose . In the above cases, the mechanics of in the upper respiratory tract is affected. And also in cases of tracheostomy where, the upper airway is cut off and this also affects the mechanics of the upper airway. The arterial supply to the trachea is derived from the inferior thyroid arteries. Venous drainage is via the inferior thyroid veins. Lymph vessels drain to the deep cervical, pretracheal and paratracheal nodes. The trachea is innervated by the recurrent laryngeal branch of the vagus with a sympathetic supply from the middle cervical ganglion.The cough reflex helps to dislodge foreign substances from the trachea. Sensory receptors detect the foreign substances, and action potential is conducted along the vagus nerves to the medulla oblongata where the reflex is triggered. During coughing, contraction of the smooth muscles decreases the diameter of the trachea and air moves rapidly through the trachea. This helps to expel the mucus and foreign substances. The larynx is located in the anterior part of the throat and extends from the base of the tongue to the trachea. It plays an essential role in all upper airway functions, including respiration, phonation, cough reflex, swallowing, and vomiting. The larynx is connected by membranes and muscles superiorly to the hyoid bone and consist of nine cartilages connected to one another by muscles and ligaments. The first three of the cartilages which are the thyroid, cricoid and epiglottis are unpaired while the rest are paired. The epiglottis is the most superior cartilage. The superior opening of the larynx is the glottis and it is guarded by the epiglottis to help keep materials out from the respiratory tract during swallowing. The glottis is also closed to help in holding the breath against pressure in the thoracic cavity, when straining to lift a heavy weight or to defecate. The epiglottis is made up of elastic cartilage and is attached to the thyroid cartilage and projects superiorly towards the tongue. Thyroid cartilage is the largest cartilage. 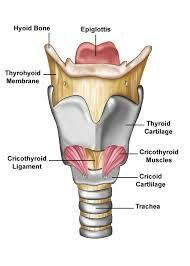 Below the thyroid cartilage is the cricoid cartilage, it forms the base of the larynx and connects the larynx to the trechea. The paired arytenoid cartilages articulate the posterior, superior border of the cricoid cartilage. The paired corniculate cartilages are attached to the superior tips of the arytenoid cartilages. The paired cuneiform cartilages are contained in a mucous membrane anterior to the corniculate cartilage. The thyroid and cricoid cartilages maintains an open passageway for air movement. The larynx prevents the entry of swallowed materials into the lower respiratory tracts and regulates the passage of air into and out of the lower respiratory tract. The vocal cords are the primary source of sound production. The pseudo stratified ciliated columnar epithelium lining the larynx produces mucus which traps debris in the air and the cilia moves the mucus and the debris into the pharynx where it is swallowed. Lymph drainage of the larynx is separated into an upper and lower group by the vocal cords. The supraglottic area is drained by vessels that accompany the superior laryngeal vein and empty into the upper deep cervical lymph nodes. The infraglottic zone similarly drains with the inferior vein into the lower part of the deep cervical chain. The nerve supply of the larynx is from the vagus via its superior and recurrent laryngeal branches. The superior laryngeal nerve passes deep to both the internal and external carotid arteries and there divides into a small external branch, which supplies the cricothyroid muscle, and a larger internal branch that pierces the thyrohyoid membrane to provide sensory supply to the interior of the larynx including the vocal cords. The recurrent laryngeal nerves provide the motor supply to the intrinsic muscles of the larynx apart from cricothyroid, as well as the sensory supply to the laryngeal mucosa inferior to the vocal cords. The internal laryngeal nerve runs beneath the mucosa of the piriform fossa. In this position it can easily be blocked by the topical application of local anaesthetic to provide anaesthesia for laryngoscopy and bronchoscopy. Injury to the recurrent nerve can occur in thyroidectomy. Also recurrent laryngeal nerve paralysis may occur in malignant or occasionally benign enlargement of the thyroid gland. Respiratory obstruction after thyroidectomy can also result from direct trauma to the tracheal cartilages. Laryngectomy is the removal of the larynx and separation of the airway from the mouth, nose and oesophagus. In a total laryngectomy, the entire larynx is removed (including the vocal folds, hyoid bone, epiglottis, thyroid and cricoid cartilage and a few tracheal cartilage rings). The physiotherapist plays a major role in chest clearance, care of the stoma site and providing education on life following a laryngectomy. ↑ Drake, RL, Vogl, W, Mitchell, AW, Gray, H. Gray's anatomy for Students 2nd ed. Philadelphia : Churchill Livingstone/Elsevier, 2010.